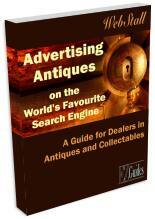 Our guide Advertising Antiques on The World's Favourite Search Engine is provided free as a document in Adobe Acrobat format. This is suited either for screen reading or printing. Most computers have software that can open this type of document - if yours doesn't please click here to download Acrobat free from Adobe's website.